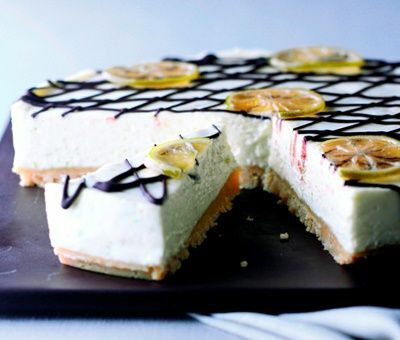 This is a twist on our classic Key Lime Pie recipe - making it into a luscious cheesecake finished with dark chocolate for an added wow factor! 1. Mix the biscuits with the melted buttery spread then press onto the base of the tin. Chill for 10 minutes. 2. In a large bowl, whisk together the soft cheese and condensed milk until smooth. Add the lime zest and juice (watch it thicken!). Spoon the mixture over the base and chill for at least 2 hours, preferably overnight. 3. Remove the cheesecake from the tin and place on a serving plate. Drizzle the melted chocolate over the top and sides, then leave to set. To finish, gently simmer the lime slices in a little icing sugar and water – there should be barely enough water to cover the slices. The syrup will reduce to a sticky coating on the limes. Transfer the lime slices to baking parchment to set before placing on the cheesecake. I have just made it and it was very quick and easy, i used full fat condensed milk bought by mistake and it still worked well and the lime tastes great!! Highly reccomend it! Hi Lisa, sorry to hear this recipe didn't work for you - normally we wouldn't suggest using a food processor to make the filling - it only needs gently whisking so this might have had an effect on the set. Sounds like you made it in to a lovely individual dessert anyway! Super, super quick and easy to make and absolutely delicious!!! Everyone impressed with the end result, so much so I've made this cheesecake 7 times :) thank you Carnation! can lemons be used instead of limes??? Lime and Bitter Chocolate Cheesecake is rated 5.0 out of 5 by 2. Rated 5 out of 5 by Tessa in Spain from Easy and quick My friend gave me a bag of limes from her tree here in Spain so looked for a receipe on the internet and glad I found this receipe.I am going to a BB Q this evening so just the right thing to take! Rated 5 out of 5 by Sheesh from Easy and delicious Made this as was looking for an easy no bake desert for a family meal. Easy to follow recipe, easy to make and even easier to eat!! !